Three Cowley College employee teams and three student teams took part in the Fit Day events held Friday afternoon inside W.S. Scott Auditorium. Participants took part in eight events. Events included balloon pop, hula hoop contest, human wheel barrow, spoon and egg race, sack race, three legged race, hungry, hungry hippo, and pushup challenge. The day concluded with a tug of war competition between the employees and students. Although the employees won the tug of war contest, the student team of Peyton Cravens and Josh Wolf finished in first place among the six teams in the overall competition and took home $100 each. Sixth Place – Dr. Dennis C. Rittle and Jenette Hanna. Fifth Place – Dr. Chad Killblane and Dr. Kori Gregg. Fourth Place – Gavin Brown and Dr. Michelle Schoon. Third Place – Gunner Johnson and Madison Mitchell. Second Place – Lane Leven and Morgan Bruce. 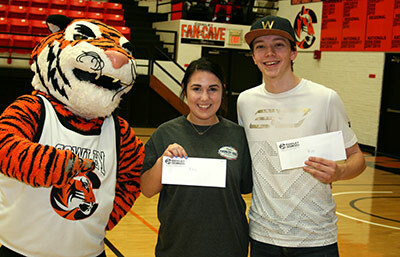 First Place – Josh Wolf and Peyton Cravens.